Chad Kackert is a native of Simi Valley, California where he played ball at the University of New Hampshire. He was signed by the Jacksonville Jaguars as an undrafted rookie following the 2010 NFL draft but unfortunately was released prior to the start of the season. 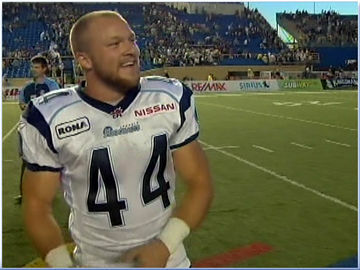 Kackert then made his way North of the border finding a spot in Toronto where he would finalize his deal with the Argos on February 14, 2011. Kackert joined the Argos in training camp over a year ago beating out second year import running back Dwayne Wright to crack the roster. Even though Chad made the team he did not at all get to touch the field as much as he would have liked to, mostly sitting behind the then all-star starter Cory Boyd. Just recently though with the release of Boyd, Chad’s chances of becoming a regular on the offence began to look up. As of Sunday, Kackert received news by coach Scott Milanovich via telephone that indeed he would become the starting running back for the storied Toronto Argonaut organization. A year ago Chad rushed for 349 yards on 57 carries for a solid average of 6.1 yards per carry. His best performance came at the end of July in 2011 when he rushed for 139 yards and two touchdowns on 20 carries. Proving why he would be a perfect asset moving this team forward. Although Chad did have difficulty with holding onto the ball with a total of 4 fumbles last year. Kackert was all smiles when he heard the news that he would become the new starting running back for the Argos stating “that he dreamed of this opportunity for a very long time”. Although upset at the fact that his new found success had to come at the cost of another player being released. The Toronto Argonaut organization however guarantee that Boyd will continue to have success within the CFL. Nonetheless Kackert is excited about his new role within the Argo organization and is even more excited at a once in a life time opportunity. Kackert understands the new found pressures and duties as a starter and hopes to become the type of player that can help the Argos get over a recent offensive hurdle. In all Kackert should add a jolt and excitement as a fresh perspective to this years offense moving forward. A sports fan and a communications expert. Having fun and trying to make a living at it.